The entry categories are Starters or Salsas; Salads; Sweets and Best Photo. A total of $6,000 in cash prizes will be awarded. Upload your recipe by February 28, 2010 and see the contest rules.Florida is the major U.S. supplier of strawberries from November through early spring. For those who want to buy foods with fewer carbon miles and purchase domestic rather than imported produce, each carton of Florida-grown strawberries has geographic identification noting where the product was grown. 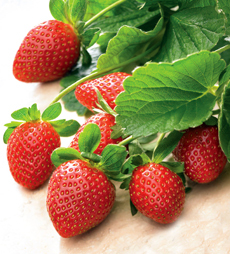 Strawberries are not only nutritious; they’re one of our favorite diet foods. Eight strawberries contain more vitamin C than one orange. A one-cup serving (about 8 to 10 medium-sized berries) contains 45 calories and has no fat, cholesterol or sodium. So, even if you don’t enter the contest, make strawberries part of your healthy “New Year’s Resolutions” diet.